You’ve traveled across the country, tracking down dark dimensions in search of your missing family, when you stumble upon a violent one that has taken over the city of Seven Oaks, North Dakota. The black smoke is chasing people and captured a young girl right in front of your eyes. What caused this dark dimension, and who is being controlled by its influences? You must investigate for the truth behind the town’s recent tragedy if you want to save its future. A friendly spirit may help you, but can you trust him? 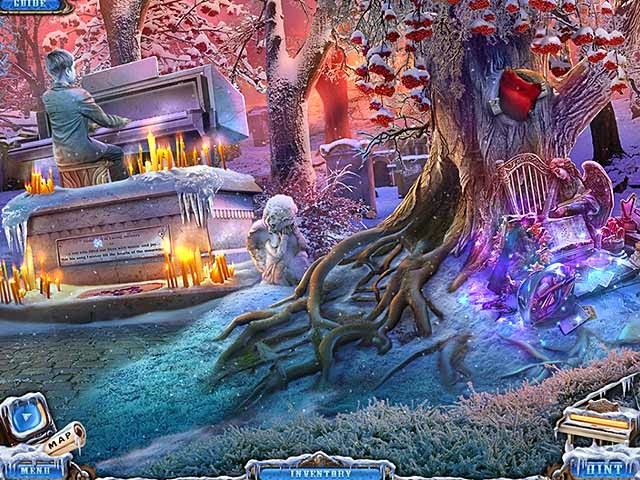 Free the people and save the town in this exciting hidden-object puzzle adventure game! Bonus chapter, featuring an exciting epilogue! I got to trial this game a couple of weeks back (here). From there I actually ended buying and playing all the past Dark Dimension games I could get my hands on :) I believe I am now up-to-date - with Somber Songs. I decided to get the collector's edition due to the enjoyment I got from the previous games (though I just played the normal version of them). The collector's edition had an extra game, which was kinda cool! Extended the story and the game play. Another winner, though, like I've found with other DD games, I had some accuracy issues with selecting and using some items.